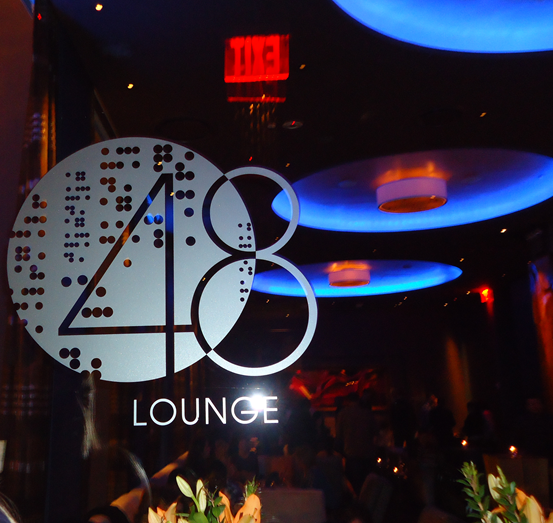 A midtown hot spot, 48 Lounge is located on the West Side of 48th Street between 6th & 7th Avenues. After work on a Friday night, expect to see business men neatly suited and women in heels no less than 6 inches tall. 48 Lounge’s hostesses are mostly tall, slim women uniformly outfitted in little black dresses. You will feel like you are in a Vegas style lounge with high rollers. Stylish, but reserved, 48 Lounge is a cool place to sip on specialty cocktails or imported beer. Munch on anything from tater tots to lamb lollipops. 48 Lounge offers a menu that’s pleasing to both foodies and those with conservative taste buds. Lean back on a swivel chair or hangout with a group of friends on their plush sofa sectionals. Whether you are popping bottles or sipping a single glass of wine, 48 Lounge has an admiring midtown vibe. Categories: Food Wine and Spirits, Miss Metropolitan Junkie, Urban Aristocrats, What's Hot in N.Y.C.